Mars was an early series of Soviet spacecraft designed to fly by, orbit, and land on the planet Mars. None of the probes was completely successful and most were almost total failures. The Soviet Union also launched several other spacecraft between 1960 and 1971 that were intended to explore Mars but, in the wake of their failure, did not acknowledge their true purpose (see Mars, unmanned spacecraft). These included Marsnik 1 and 2, Sputnik 22 and 24, Zond 2, Cosmos 419, and Mars 1969 A and B. Sputnik 22, an intended Mars flyby mission, was launched at the time of the Cuban missile crisis in 1962. When fragments of the exploded spacecraft showed up on the United States Ballistic Missile Early Warning System radar in Alaska, there was momentary alarm that a Soviet nuclear attack might be underway. Cosmos 419, had been intended to overtake Mariner 8, scheduled for launch two days earlier, and so become the first spacecraft to orbit Mars. In the event, Mariner 8 also failed and the race to be first in Mars orbit was won by Mariner 9. Flyby probe. On March 21, 1963, with the spacecraft 106 million kilometers from home, communication was lost, perhaps due to a malfunction in the probe's orientation system. Closest approach to Mars took place on June 19, at a distance of about 193,000 kilometers, after which the spacecraft entered solar orbit. Mars orbiter and descent probe. Mars 2 released its descent module – the first attempt to soft-land on the Red Planet – 4.5 hours before entering orbit on November 27, 1971. However, the descent system malfunctioned and the lander crashed at 45 S, 302°W, delivering the Soviet Union coat of arms to the surface. Meanwhile, the orbiter engine performed a burn to put the spacecraft into a 1,380 × 24,940 kilometers, 18-hour orbit about Mars with an inclination of 48.9°. Scientific instruments were generally turned on for about 30 minutes near periapsis (orbital low point) and data was sent back for several months. Identical spacecraft to Mars 2, except the Mars 3 orbiter also carried a French-built experiment called Spectrum 1 which measured solar radio waves in conjunction with Earth-based receivers to study the cause of solar outbursts. The descent module was released on December 2, 1971, about 4.5 hours before reaching Mars and, through a combination of aerobraking, parachutes, and retrorockets, successfully soft-landed at 45°S, 158°W. However, 20 seconds later, its instruments stopped working for unknown reasons. The orbiter entered an elliptical, 11-day orbit about Mars from which it sent back data for several months. Intended Mars orbiter. The probe's retrorockets failed to fire to slow the craft into Mars orbit and it flew by at a range of 2,200 kilometers, returning just one swath of pictures and some radio occultation data. Mars probe intended to enter martian orbit and comprehensively photograph the planet. The spacecraft reached Mars on February 12, 1974, and was inserted into a 1,760 × 32,586 kilometers orbit. However, due to computer chip failures, the orbiter operated for only a few days, returning atmospheric data and images of a small portion of the martian southern hemisphere. Mars probe consisting of a flyby bus and a descent module. Mars 6 reached Mars on March 12, 1974, and the descent module separated from the bus, opened its parachute and began to fall through the martian atmosphere. As the probe descended it transmitted data for 150 seconds, representing the first data returned from the atmosphere of Mars. Unfortunately, the data were largely unreadable due to a flaw in a computer chip and, shortly after the retrorockets fired for landing, all contact was lost with the craft. Mars 6 landed at about 24° S, 25° W in the Margaritifer Sinus region. Mars probe consisting of a flyby bus and a descent module. 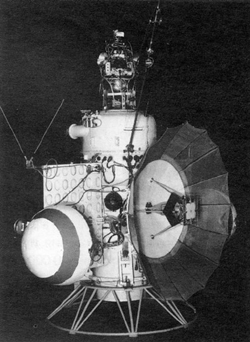 Mars 7 reached Mars on March 9, 1974, but the landing probe separated prematurely and missed the planet by 1,300 kilometers.